Known as the "fairytale hotel," Dalen Hotel in Telemark is built in a grand, romantic style adorned with dragonheads, turrets, spires, cornices, towers, and balconies. Its lavish architecture was inspired by traditional stave churches from the Middle Ages. Dalen Hotel has retained its authenticity and historical significance, and the present-day hotel is almost identical to the wooden castle that opened in 1894 — a time when royalty and European nobility frequented is prestigious halls. The historic hotel has been visited by King Oscar II of Norway and Sweden, the King of Siam, Emperor Wilhelm of Germany, and King Leopold of Belgium, to name a few. The sheer richness of the hotel's design and the property's enchanting nature continue to draw illustrious guests from around the world. Visitors to Dalen Hotel cannot miss the transfixing central hall with its stunning stained glass windows. Guests enjoy meals served in the stately dining room — a popular place for weddings and other special events. To the east of the hotel is a seven-acre park perfect for leisurely strolls and quiet repose. Mountains soar above the hotel to the north, south, and east, and the famed Victoria and Henrik Ibsen canal boats sail the scenic Telemark Canal during the summer months. No matter where guests look, they are awed by the fairytale hotel and its picturesque setting. 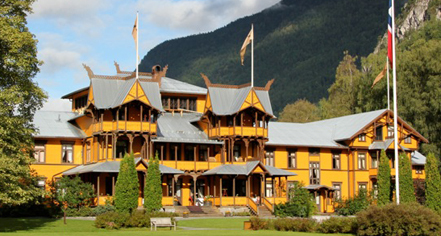 Dalen Hotel, a charter member of Historic Hotels Worldwide since 2012, dates back to 1894. Børve, a German-educated architect versed in Swiss style, designed the castle hotel based on inspiration drawn from traditional medieval stave churches. 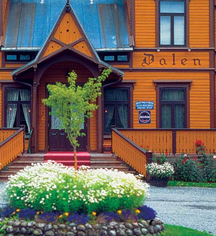 Dalen Hotel is adorned by opulent details like dragonheads and soaring spires. Pet Policy: Service animals allowed: Yes. Pet allowed: Yes. Fee: Please contact hotel. Shuttle Service: Shuttle service to and from the ferry may be scheduled through the resort's concierge. Rates apply. Learn more about the History of Dalen Hotel .